Speech Sound Structures: An understanding of the speech mechanism and some knowledge of the landmarks of the oral cavity is necessary if we are to be competent teaching children speech sounds. This page gives a brief overview of the speech sound architecture. Perhaps the most interesting aspect of the oral cavity is that its primary function is to ingest food and act as a passageway for the respiratory system. Moreover, the speech sound structures, with which we create speech sounds, primary role is to keep us alive. For instance, the larynx's primary function is to keep food from falling into our lungs and choking us. Similarly, the tongue, which is fundamental to the creation of many speech sounds, pushes pulverized and masticated food into the pharynx as part of the swallowing phase. Humans are fairly clever beings in that we have learnt to craft speech sounds, with all their wondrous complexity and potential for expression, using borrowed equipment. Tongue: The tongue is a large muscular structure that nearly fills the oral cavity. The tongue is not one large muscle as some might suppose but consists of several muscles grouped as intrinsic and extrinsic tongue muscles. The tongue is able to produce incredibly fine and complex movements, by either directing the breath stream during consonant production or elevating and lowering to form a resonance vessel for vowel sounds. 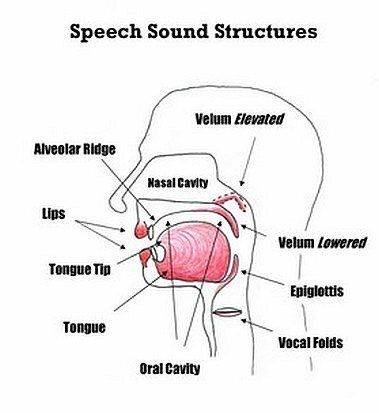 Velum: If we refer to the above drawing we can see that the velum elevates and lowers during speech production. Like the tongue, the velum is incredibly coordinated and capable of very fast and fine movements. During speech the velum's prime function is to close off the nasal cavity. This is a necessary function as most speech sounds are non-nasal. If we didn't have the velum closing off the nasal cavity, we would all be talking through our noses, which would not be pleasant to listen to or produce. The velum does open for three consonant sounds - the nasal sounds /m/ /n/ and /ng/. Alveolar Ridge: The alveolar ridge is a structure that lies directly behind the upper front teeth. It's considered an important structure in speech because the tongue tip continually touches the ridge to form consonant sounds. In fact, in the creation of speech sounds, the tongue tip touches the alveolar ridge more than any other oral cavity structure. Lips: The lips play a role in changing the resonance of different speech sounds. By altering the shape of our lips we can form different speech sounds. For instance, for plosive sounds such as /p/ and /b/ the lips are compressed and then opened to produce a rapid, explosive release of the breath stream. Palmer, J.M. (1993)Anatomy for Speech and Hearing. Lippincott Williams and Wilkins. Williams, A.L. McLeod, S. & McCauley, R.J.(2010)Interventions for Speech Sound Disorders in Children. Paul H. Brookes Publishing Co.